Purchased these to compliment a black granite sink also purchased from Overstock. They work great and are functional. Would recommend and purchase again. This Drain Combination Package is designed for double bowl kitchensinks. These drains feature a durable brass construction with anoil rubbed bronze finish. Keep your sinks clean with this drain combination packageespecially designed for double bowl sinks. Attractive as well asfunctional, these brass and copper drains glow with a bronzefinish. This package contains both a kitchen strainer drain and adeluxe garbage disposable drain with a basket. It is Insinkeratorbrand compatible. As in the title, the item is primarily plastic which is contrary to the listing that indicates that it is SOLID BRASS. The item is NOT SOLID BRASS, it is primarily PLASTIC!!!! The finish looks good, but the advertising and listing is totally deceiving by indicasting something that it is not. This is in my farm sink! Works well, no leaks or issues. I love the color and the screw down feature. Definitely holds well. This is the double drain with disposal. The product looks great at first, then I noticed that the main drain flange connects to a white plastic piece which is VERY visible when the strainer basket is not in-place. They could have easily used black ABS as they did on the disposal flange. All that being said the product description lists this as "Made from durable solid brass"... Well, parts may be, but others are not. The plug on the garbage disposal is very hard to get in and out. If you don't pull it straight up it becomes very hard to get out. I tried many many times and it is so annoying I will get a rubber plug instead. We bought this drain combo to place in our Sinkology copper farmhouse sink. The quality of this hardware is great, and it looks absolutely fantastic with both the sink and oil rubbed bronze faucet. The price can’t be beat! I ordered this double drain for my kitchen sink, but one of the drains was for a disposal. I don't have a disposal, and if I had known, I would not have ordered it. I now need to return them and pay return shipping, and then order new ones. All this work and expense could have been avoided if the description was more explicit! This is a very attractive product and the plumbers had no trouble hooking it up to the recommended garbage disposal brand of Insinkerator. I am careful not to use any type of abrasive cleaners on it. The color matches my Delta brand faucet perfectly. I would definitely recommend this product. Excellent replacement package for old sink drains. Looks great now. This product looks beautiful in my sink next to my bronze faucet. Priced this product in Home Depot and it was twice as much for both pieces. This set really upgraded the look of our kitchen sink when we remodeled our kitchen. Very impressed and great quality, in my opinion. Easy to install and came well packaged as well. great price for this set. I am very pleased with the product and with the service. Match perfectly with our new Polaris copper sink. Great price! I read some reviews about part of it being plastic but once it was installed I don't think there's any chance of ot breaking. Looks perfect with my copper sink! Perfect for our copper farmhouse sink! Good quality and good price. I would have totally forgotten to get these if it weren't for the recommendation when I was purchasing the sink. I bought these for a new copper sink being installed in the remodeled kitchen. They are going to look fabulous. Seems to be well made and the color is true to the pictures. I had been unable to locate this item in my local hardware stores so was thrilled to find what I needed to match the hardware in my kitchen. Nice coloring/finish and works well with our new oiled bronze faucet also ordered from OS.com to replace chrome fixtures in our new home. The quality is spot on and easy to install. "Why does it say in the description: note- this model does not hook up to garbage disposal?" Ours is hooked up to an Insinkerator brand garbage disposal....here's what the description reads: "This package contains both a kitchen strainer drain and a deluxe garbage disposable drain with a basket. It is Insinkerator brand compatible." So, it will hook up as long as you use the Insinkerator brand. "I've seen mixed reviews on this product and one person said it was plastic but the spec description says it is brass, bronze copper. So, is this product metal or plastic?" 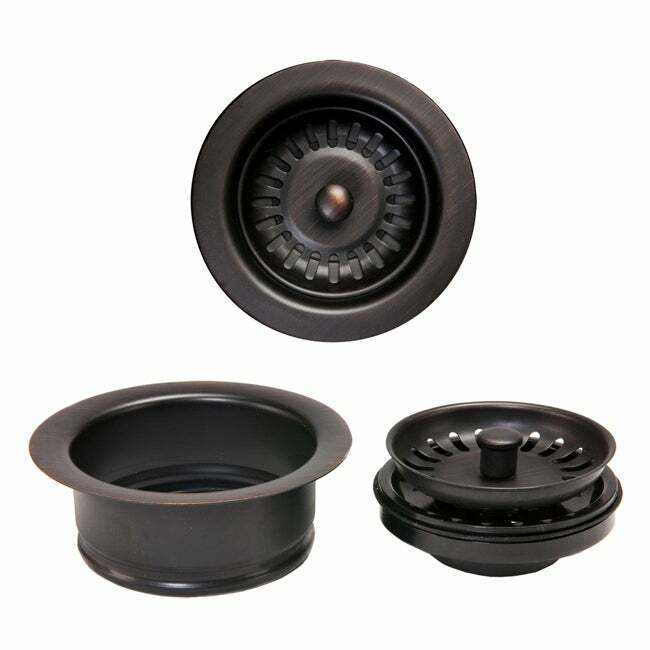 To be clear on the material of these two drains in this package, both the D-130ORB (garbage disposal drain) and the D-132ORB (basket strainer drain) are made up of brass and PVC. The strainer baskets and flange bodies are brass and the rest of the drain construction is PVC. It is definitely NOT plastic, and it's beautiful. "How close to Moen's ORB finish is this drain? Can the disposal flange meet up to either a Wasteking or Insinkerator garbage disposal? Thanks"
These disposal drains are compatible with Insinkerators but not Waste King. "will these work with a fireclay farmhouse sink?" Most kitchen sinks use standard fixtures. I would need to know the specific model number of the sink you are looking at in order to give you more information. Yes. That is exactly the style I have and it fit no problem. As mentioned above the drain holes are usually standard. "These answers don't make sense. People are asking if this hooks up to a garbage disposal unit on one side and a regular sink on the other. I see both answers - "no, it doesn't" and "yes, it will work". It would be nice to know before ordering if these are the correct products that go with the sink purchase. Where can we get those answers?" Yes, one is made to hook up to a disposal, which I did. The other is made for the other side. Lower portion screws directly into the garbage disposal. I'm no plumber ( far from it) and I had it in 15 minutes. "does the double sink mean that on one side it can hook up tho the garbage disposal unit and the other sink is the normal strainer side." Thank you for your question on this lovely set. Yes, this set comes with one deluxe garbage disposal drain with basket and one kitchen strainer drain. yes, one is for the disposal and the other is just for the other side of the sink.